After getting your player’s card (if you choose to do so) you will go to the cage. The cage is a series of windows with either bars or plexiglass separating you from the cashier. There you will buy your chips. You will want to have an idea of how many chips you want to sit down with. If you are not sure, check the requirements for the level of blinds you would like to play. Each will have a minimum and maximum buy in (for example a $1-$2 No Limit Hold'em game might have a minimum buy-in of $60 and a maximum buy-in of $300 where a $2-$5 NLHE will have a higher range, something like $200 to $1,000). Every player’s goals will be different. If you are looking to get some experience and guard against a big loss, then buying in for the minimum may make sense. However, if you want to be competitive, attempt to keep pace with other players, and enhance your odds of winning some reasonable money, then buying in for the maximum is generally the better strategy. A minimum buy-in makes it both difficult to leverage your chip stack to put pressure on larger stacks and mitigates your winnings should you hit a monster hand and someone calls your all-in bet. Once you have your chips, you need a seat. If there are open seats, you are generally free to sit down at any open seat at any table you would like. It is a good idea to wander around a bit and watch several tables for a few minutes to see where you might feel most comfortable. Some tables will be wild, with players raising and re-raising each other every hand. Others will be full of tight players (commonly referred to as “nits”), with a lot of tight play. Most, of course will be somewhere in between. Pick a seat where you will be most comfortable. And remember, in cash play you can always move. If once you sit down, a table turns out to be outside of your comfort zone, move! And do so sooner rather than later. If there are no open seats for your chosen game, you will want to go to the sign-in area and/or find a “floor” (one of the official looking directors usually strolling the cash play area in a blazer and a name tag) to put your name on a list. You will be called when a seat is open and you will have to sit at the seat that has been identified for you. Again, if you feel that you are overmatched at your assigned seat, you can always get up and ask to be put back on the list again, or request a table change so when a seat opens up you can be moved. If the table you are at is generally playable, but the players to your immediate left or right are causing you problems, if a seat elsewhere at the table open up, you can ask to move there. Once you sit down at a table, the dealer will offer the choice to start playing immediately, usually meaning you post the cost of a big blind no matter what position you are in (although this requirement varies from venue to venue), or wait until the blinds naturally come around to you. We generally recommend waiting, as it gives you the opportunity to observe the styles of the other players at the table before you put your money down. There are a couple of other things you may hear when you sit down. If you sit down in a seat between the players who are the small blind and the button, the dealer may ask you “Do you want to buy the button?” This means you have to put down the cost of the small and big blind, and you then become the final position to act post-flop (i.e. the button). You can respond with some version of “sure” and pay the blind prices and you become the de facto button. However, if you say no then you will sit out the hand and the button will pass you in the next hand so you will join the action in the cutoff position. Once you are playing, you can always add money to the table up to the maximum buy in, but you are not allowed to remove money from the table without giving up your seat. You are entitled to hold your seat as long as the table is active and you have chips in front of you, so if you bust, you can keep buying back in for an amount between the maximum and minimum range. You will see the dealer take money out of most pots and put it aside, usually dropped in a slot to a box attached to the table. This is the “rake” the casino takes for each hand. So don’t worry this is not the action of an unscrupulous dealer, this is how the casino makes their money off cash games. Often there will also be a chip held aside for the ever-building “bad beat” jackpot (when a monster hand loses to an even bigger hand – such as quad kings losing to a straight flush), which may be placed separately. After most pots won (unless it was just blinds), many players will give the dealer a small denomination chip or chips as a tip. This is not mandatory, but if you fail to tip repeatedly you may get some unfriendly stares from regulars who are tipping. In a $1-$2 game, in an average pot, a $1 tip is fairly standard; if someone wins a huge pot for over a hundred dollars they may tip a bit more. Most casinos allow you to leave the table for a set period of time and retain your seat, as long as you have chips. This varies but is usually somewhere between 20 and 60 minutes. If you need to leave to go get something to eat or the like, it is good to ask what this time period is. When you return within this time frame, if you missed at least one rotation through your blind, you will likely have two small buttons in front of you indicating that you will need to pay the small and big blind to re-enter the action because you missed them. If you missed more than one rotation, you still only have to pay one set of blinds. If you stay away from the table too long, especially in a busy room with a waiting list, you may come back and find your chips gone and someone else sitting in your seat. Don’t panic: the floor has bagged and marked your chips and you’ll just need to touch base with her to get your chips back. However, you have now lost that seat and will need to start the process of finding a seat again, either by selecting an open seat of there is no wait list or getting back on the wait list. Hopefully you have chips left at the end of your visit, and perhaps even more than you started with. If so, take them back to the cashier cage and you can turn them back in for cash. There usually is a place to leave a small tip for the cashiers as well if you so choose. 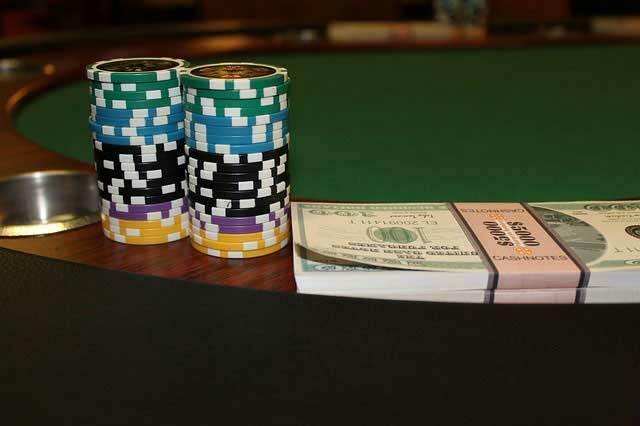 For more rules and guidelines of playing in a cash game see our Rules for Cash Games article, which goes into more detail.